Is distance learning also known as correspondence education the right choice for you? This style of learning requires an element of self-discipline but there are many advantages. If you find yourself short of self-discipline but desire to increase in this area, God delivers when we ask in His Name. Distance Learning takes many shapes in today’s educational market. For Patriot Bible University students, we bring 35 years of experience to delivering a competent product. It is important that the prospective student determine if he/she is right for distance learning. In a nutshell: the student selects a course and orders the coursebooks. PBU sends them out promptly by USPS Priority Mail. The student returns their completed workbook to PBU for grading which is returned to the student promptly after grading. Academic skills and subject mastery are accomplished through clear explanation and responsive repetition. The graded workbook forms the basis of the student’s grade. Our ‘teachers’ are Christianity’s most widely respected authors and teachers. 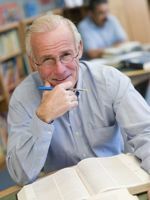 Each self-directed student gains the benefit of being taught by renowned men of God through reading their books. Books are coupled with the KJV Bible and Patriot workbooks to give the student a spiritually appraised education. One would be hard pressed to assemble a better group of teachers! 1. Self-directed study permits flexibility in your schedule; allowing you to continue your education without interrupting your present responsibilities. Patriot external programs are designed for the mature person whose responsibilities will not permit full-time on-campus study. 2. Helps you to be more effective in the Lord’s work by giving you more than ‘head knowledge’; instead equipping you with knowledge and purpose. 3. This ministry makes a Christian education affordable. Students may even set their own tuition rate. No student loans or grants are required to get your degree! 4. The KJV Bible is our central textbook. Our curriculum constantly leads to extensive use of God’s Word. 5. A two-credit course may be completed every 2-4 weeks. Measurable progress is seen as you study only God’s truth. Human reasonings outside the truth of the Bible are not taught here. 6. Credit for college-level life and ministry experience is offered towards Bachelor degrees. 7. Our program is tailored to meet your individual needs. Advisors are available to personally assist and guide you toward your goals in Christian service. 8. The student is given step-by-step achievable objectives leading toward a well-rounded and relevant study of the Bible applied to our lives in today’s world. 9. Students from other schools may transfer in and finish their degrees – or earn advanced degrees. Transfer credits may only be applied towards Bachelor degrees. 10. Each Patriot course promotes spiritual growth, builds character, strengthens your home and church, and offers preparation for a Christian ministry. In short, a Patriot Bible University will equip you to serve the Lord in whatever way He has called you. We give you much more than ‘head knowledge’.